For those who like to keep all their important and unimportant data in their pocket, and feel that hard disk is a little out of style these days, Saygus V2 or to call it right Saygus V-Squared is the answer to their prayers. This amazing Kevlar back cover super light phone weighs just 141 grams and has 2 microSD storage slots of 128Gb each, 64 Gb onboard storage and 3 Gb RAM that makes upto 320 Gb of storage space in a single phone. Amazed? Don’t be, as there is a lot more to come. 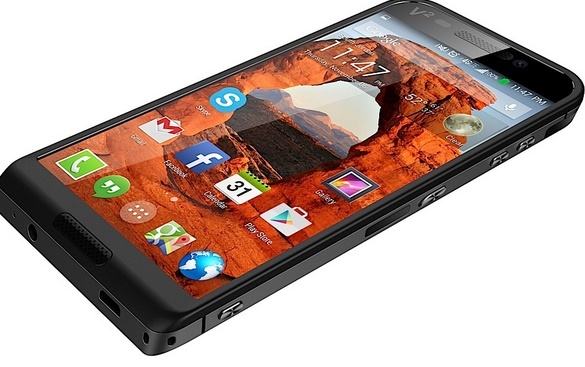 Saygus V2 is a 5” device which is bootable by the SD card and runs on Android 4.4.4. It has IP7X waterproof rating which makes it first of its kind. With 1080p display, 3500 mAh removable battery, Qualcomm Snapdragon 801 quad core processor, dual flashed Rear camera of 21 Megapixel and Front camera of 13 Megapixel, Saygus V2 has proved itself to be the first new generation smartphone that is not the product of titans like Sony, Samsung, HTC etc. For Security and Privacy freaks it has a biometric fingerprint recognition system on its side, for music fans it has audio technology of Harmon Kardon, for the lazy bums it has wireless Qi charging technology and finally for the developers it promises to provide root access. Let’s hope this Over-Smart phone is not Over-priced! Though prices aren’t out yet but it might be around $300 and that’s not a lot considering the unending list of unbelievable features Saygus V2 is providing us. Saygus V2 will be available in market in approaching months so keep your piggy banks ready as this might be the phone of your dreams!